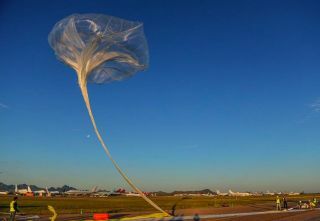 A World View Enterprises balloon about to lift off from southeastern Arizona on March 8, 2015, on the company's first commercial flight. The cost of sending a scientific experiment to the stratosphere aboard a balloon just went down. The new system applies to payloads that range in mass from less than 1 pound (0.45 kilograms) to more than a few hundred pounds, World View representatives said. "Until now, access to the stratosphere has been incredibly rare and very expensive. That’s what makes World View’s fractional payload pricing model a game-changer," World View chief scientist Alan Stern, who also leads NASA's New Horizons Pluto mission, said in a statement. "We plan to take what was rare and make it routine and affordable." World View has already lofted payloads for NASA and other customers on unmanned balloon flights, and the company is working to get people to the stratosphere as well, for $75,000 per seat. Each manned flight would feature six paying passengers and two World View crewmembers. World View hopes to start launching these crewed flights, which would allow passengers to see the curvature of the Earth and the blackness of space, sometime next year, company representatives have said.